Entire Travel Group’s senior managers were honoured to meet some of Tahiti’s leading tourism operators on a recent visit to Papeete, but their most memorable encounter was with new star of French Polynesia tourism, the ‘Tahitian Dreamliner’. The aircraft – the first of four Boeing 787-9 Dreamliners Air Tahiti Nui is taking delivery of between now and mid 2019 – is now operating the airline’s Papeete-Auckland route until 31 March 2019, offering passengers a new three-cabin configuration that for the first time includes Premium Economy. Entire Travel Group CEO Brad McDonnell and Sales Director Greg McCallum, along with Tahiti Travel Connection Product and Sales Manager Tina Heyer, were treated to a private inspection of the aircraft at Tahiti Faa’a International Airport by Air Tahiti Nui’s Senior Vice President Commercial and Marketing, Christopher Korenke. McCallum says the new aircraft is transforming the travel experience for visitors to Tahiti. 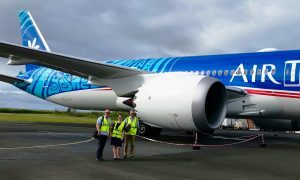 “The Tahitian Dreamliner is part of a revamp of Air Tahiti Nui’s entire fleet and it ushers in a new standard of comfort for visitors to French Polynesia,” says McCallum.